The Command has yet again recorded some successes in the fight against crime, as contained in its "Ember" months operation order. 1. 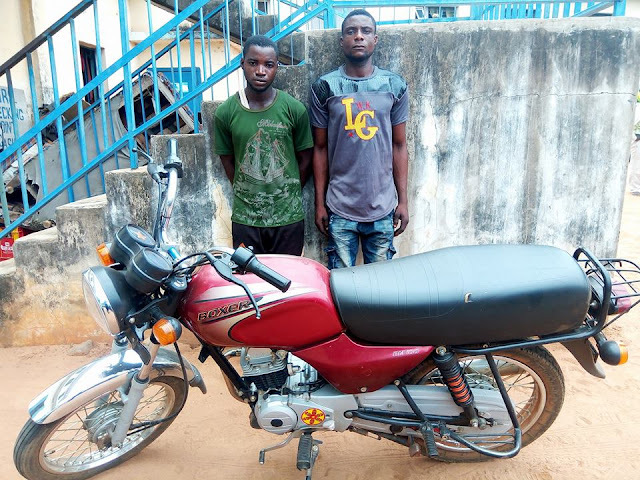 ARREST OF ARMED ROBBERS AND RECOVERY OF A STOLEN MOTORCYCLE : SARS operatives of the command based on intelligence, during the week arrested one Donald Agena and Ezekiel Arger of Udei and Ukpan in Guma LGA of Benue State and recovered an unregistered Bajaj motorcycle stolen from Niger State . The suspects during interrogation, confessed to have snatched the motorcycle from one Umar Yakubu -an Okada rider of Maaiki village in Lapai LGA of Niger State after strangulating and burying him in a shallow grave between Maaiki village and Yaba junction in Niger State. Investigation in progress. 2. ARREST OF NOTORIOUS KIDNAP/ARMED ROBBERY SUSPECTS: SARS operatives on 23/10/2017 arrested one Monday Iorgongba alias Yahooze at Mbalin-Taraku in Gwer East LGA. The suspect open up during interrogation that himself and five other members of his Gang were responsible for the kidnap of Mrs. Yuadoo Toragbidye of Radio Benue and series of robberies on Naka, Aliade and Otukpo roads in the State. Further investigation led to the arrest of one Mvendega Abu alias Wasco, Terver Tse alias Tor Tiv and Mrs. Katherine Ukoho -wife of their kingpin Isaac Nenge alias Kasco all gang members of Bukan Koto, marraraba Obi in Nasarawa State. The following exhibits were recovered from them; two AK 47 rifles with breech nos 06787 and 1964 fb 6574 with three magazines, two locally fabricated single barrel pistols, one locally fabricated revolver pistol, four live ammunition, four live cartridges, an army camouflage trouser, four jack-knives, forty-four handsets, ten SIM cards, six memory cards, thirty four thousand five hundred and twenty five Naira, a bag containing criminal charms and six shuttle bags. They all confessed to commission of various kidnapping and armed robbery in the State. Effort is ongoing to nab other fleeing members of the gang and recover their firearms while investigation continues. 3. ARREST OF KIDNAPPERS: SARS patrol team arrested Peter Adzer, Uloko Joseph, Kpenkpen Terkumbur and Terver Usongu all of Awajir town-Konshisha LGA in Benue State for kidnapping one Pastor Patrick Alexander of opposite Chinese Centre Abuja while on his way to Awajir town on the 06/10/17 and released on same date after collecting ransom. 4. RECOVERY OF A STOLEN VEHICLE AND ARREST OF SUSPECTS: SARS operatives on township patrol intercepted a RAV 4 jeep driven by one Terver Ajoga of Adele village. The suspect could not produce satisfactory documents of the vehicle at the time of arrest. Further investigation led to the arrest of one Benjamin Akpagher of Yaikyor village in Makurdi. The said vehicle which was removed from where parked at no. 11 Bachit close- Jos North Plateau State belongs to one Mrs. Lucy Kwadrem. Investigation is ongoing. 5. ARREST OF ARMED ROBBERY SUSPECTS AND RECOVERY OF A VEHICLE: On 12/10/17 @ about 2100hrs based on a distress call received that a Rover vehicle with reg no MKD 120 HD was snatched from its owner at North Bank Makurdi, a team of operation Zenda men intercepted the vehicle at a point after Ortese village In Guma LGA and arrested the following persons; Iwu Godwin, Ike Chibuike, Udo Sunday, Ferdinand Nwachukwu and Maduabuchi Mathias. Further investigation led to the arrest of one Nember and two others. Investigation is ongoing. 7. ARREST OF SUSPECTED CULTIST: One Aboje Salifu alias Capon was arrested by Police operatives in Apa LGA in possession of some quantity of dried leaves suspected to be Indian hemp with the Red Vikiings insignia. Investigation is ongoing. All the suspects would be charged to court as soon as investigation is concluded. The Commissioner of Police, CP. Bashir Makama psc+ assures members of the public of the Command's resolve to rid the State of crime and criminality while calling on them to report all suspicious acts and persons to the Police through phone number 08066006475 and 07067374913 or any other security agents.